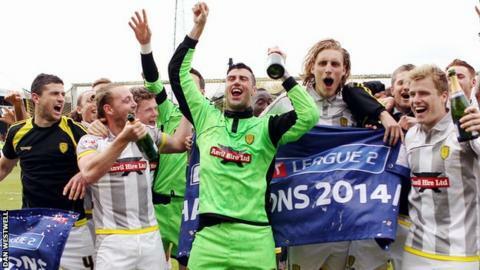 Ten-man Burton Albion secured the League Two title with a superb comeback victory at lowly Cambridge United. The Brewers, knowing a win would ensure top spot irrespective of how second-placed Shrewsbury fared, led through Stuart Beavon's header but Tom Elliott headed the hosts level. Robbie Simpson's penalty put the U's ahead after Harrison Dunk was fouled by goalkeeper Jon McLaughlin, who saw red. But a stunning Phil Edwards strike made it 2-2 and Kevin Stewart's shot won it. Nearly 1,900 Brewers fans celebrated a thrilling victory in style, but they seemed to be celebrating almost from the off after hearing Shrewsbury trailed to a third-minute goal at home to Plymouth. As it transpired, Burton boss Jimmy Floyd Hasselbaink would have led his side to the title even had they lost, something that seemed likely when their 10 men trailed 2-1 with 20 minutes left. Burton Albion lost only twice in their last 15 away matches on their way to becoming League Two champions and managed a total of 12 league wins away from the Pirelli Stadium. It had started well for the side already assured of promotion to League One for the first time in history, with Beavon's clever header from Damien McCrory's fine left-wing cross deservedly putting them ahead. But Elliott headed the hosts level on 25 minutes and the U's began to get on top after the interval, as Simpson, Liam Hughes, Tom Champion and Sullay Kaikai all had chances. And the pressure told when a poor header by George Taft led to McLaughlin bringing down Dunk and Simpson just about beat replacement keeper Scott Shearer from the penalty spot. However, the Brewers regrouped and right-back Edwards equalised with a stunning 30-yard strike. Stewart then sent the travelling support crazy with two minutes left, hitting an unlikely winner with a fine left-footed shot. Match ends, Cambridge United 2, Burton Albion 3. Second Half ends, Cambridge United 2, Burton Albion 3. Corner, Cambridge United. Conceded by Damien McCrory. Corner, Burton Albion. Conceded by Will Norris. Attempt blocked. Kevin Stewart (Burton Albion) right footed shot from the centre of the box is blocked. Goal! Cambridge United 2, Burton Albion 3. Kevin Stewart (Burton Albion) left footed shot from the centre of the box to the centre of the goal. Substitution, Cambridge United. Gearoid Morrissey replaces Tom Champion. Substitution, Cambridge United. Ryan Bird replaces Tom Elliott. Attempt saved. Damien McCrory (Burton Albion) left footed shot from the left side of the box is saved in the bottom right corner. Corner, Cambridge United. Conceded by Philip Edwards. Goal! Cambridge United 2, Burton Albion 2. Philip Edwards (Burton Albion) right footed shot from outside the box to the top left corner. Assisted by Abdenasser El Khayati following a set piece situation. Attempt missed. Tom Elliott (Cambridge United) right footed shot from outside the box is close, but misses to the right. Corner, Burton Albion. Conceded by Josh Coulson. Goal! Cambridge United 2, Burton Albion 1. Robbie Simpson (Cambridge United) converts the penalty with a right footed shot to the centre of the goal. Substitution, Burton Albion. Scott Shearer replaces Robbie Weir. Jon McLaughlin (Burton Albion) is shown the red card for a bad foul. Penalty Cambridge United. Harrison Dunk draws a foul in the penalty area. Penalty conceded by Jon McLaughlin (Burton Albion) after a foul in the penalty area. Attempt missed. Tom Champion (Cambridge United) right footed shot from outside the box misses to the right. Substitution, Burton Albion. Kevin Stewart replaces Adam McGurk. Attempt missed. Robbie Simpson (Cambridge United) right footed shot from outside the box is close, but misses to the right. Attempt saved. Liam Hughes (Cambridge United) right footed shot from outside the box is saved in the centre of the goal. Attempt missed. Sullay Kaikai (Cambridge United) right footed shot from outside the box is high and wide to the right from a direct free kick.